Looking forward to seeing how you do this Steve, i hope you will post a link to the vid once its done. LOL, well it's my first so it won't be pollished at all. I hope it dosn't dissapoint. BTW, I will be doing four in total. This one is still water, then I'll do medium seas, heavy seas and ice, maybe not in that order. I'm looking forward to it. After a second coat of gel, I used a stiff brush to stipple some gel into ripples. That’ll be a nice base for the Scharnie! You've got my full attention Steve. 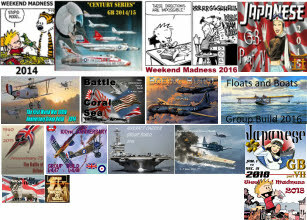 I've just bought an etch set and a Pitroad kit for the 1/700 USS San Diego. My interest has largely been piqued by your builds. 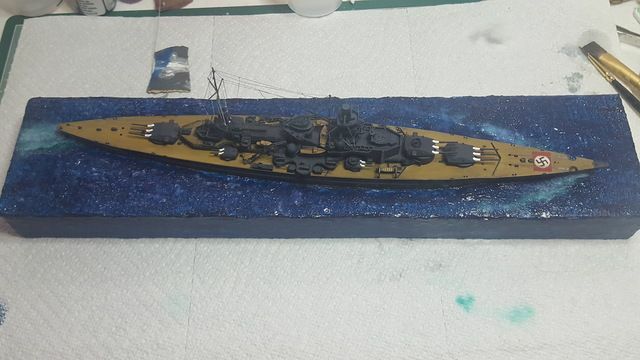 Since this is calm water I filled in the areas along the hull with gel that would typicaly be filled with cotton. 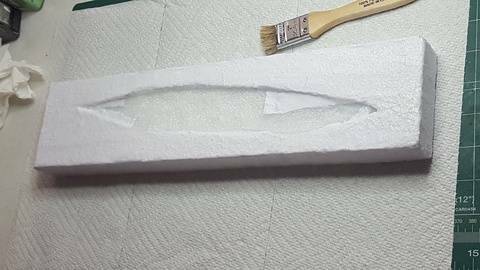 I put tape along the hull so I can remove the ship by cutting along the tape when it dries. I have glued ships in the base at this point before but it makes it difficult to paint around it, so I trying a diffrent tack this time. Now the tape removed and ship placed back into the base to check fit. Next I will add some small bow waves and wake before I paint. Adding the wave patterns, doing some studding and using the Kelvin wake pattern, everything moving through the water makes the same wave pattern. Depending on other factors such as the body's speed and weight will determine the wave length of the diverging and transverse crest’s. 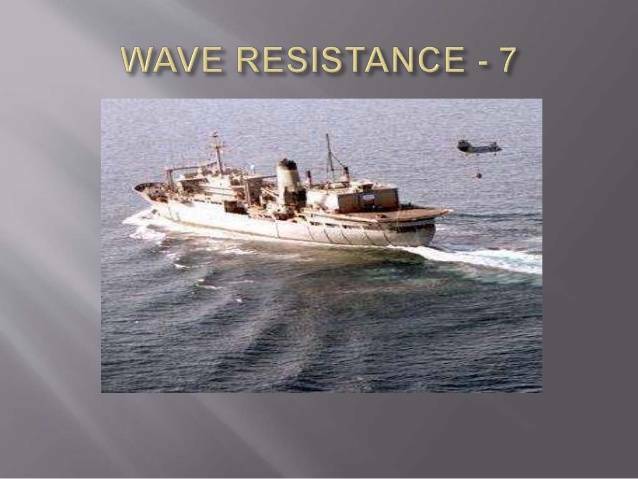 at 5 kts the wave length would be 13’. I've always known this about this wake pattern, I just never new the exact details and put it into words before. So back to the build. I added the wave patterns using the gel and laid it so it should look like little waves. Once the base is painted I can then go back and sand or add to mix it with the surrounding water. This should be subtle since the Sharn is moving slow but would be noticeable. This is always the point where I think, oh man I messed this up! But it always works out. Great work Steve and really interesting to see how this is done. Thank you. I'm glad your doing a tutorial on the your water technique. I'm almost to the stage with my Prinz Eugene to do a base. I stayed out of the color conversation, there are so many "what ifs" as to when the tops of the turrets were painted. 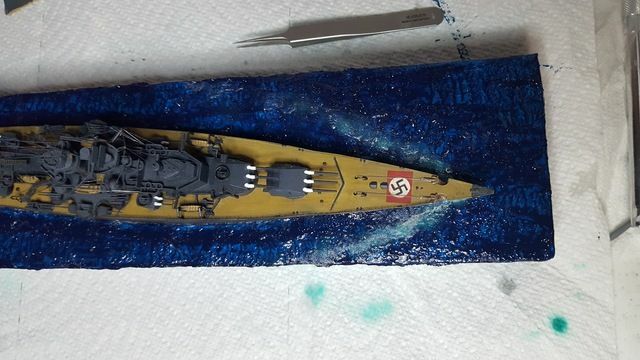 I thought painting schemes for US naval ship between 1941 and 1943 were complicated to track down, the German navy has really been a challenge. 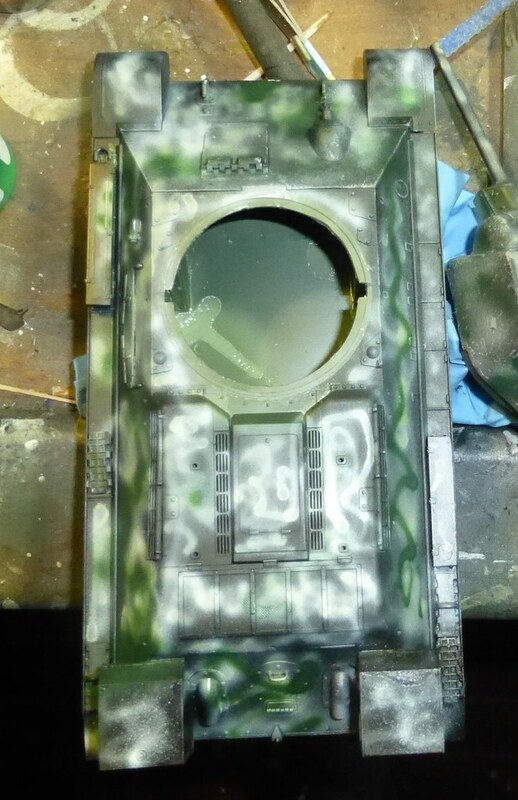 With the Prinz, I got conflicting color data were I ended up with a mix of the camo pattern of 1941 and 1943. 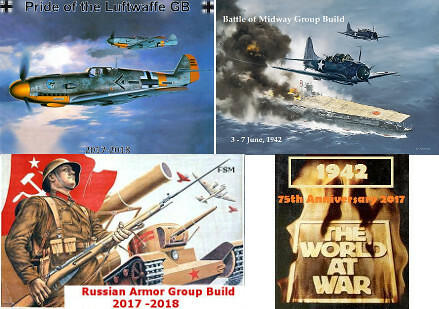 I am building for early 1941. Thanks Stick and Bish, not happy with the last so I stripped the paper off and started over. It's better to do it right than fast. No biggy, this won't take long, the process is the same. I broke one of my cardinal rules. I always cut or sand some for the wake, the only exception will be on the ice base. It's just too difficult to add waves with the gel. So after removing the paper I sanded in the wake waves and reapplied the paper. So back to the stippling for the ripples. I'll post when I get to the painting. 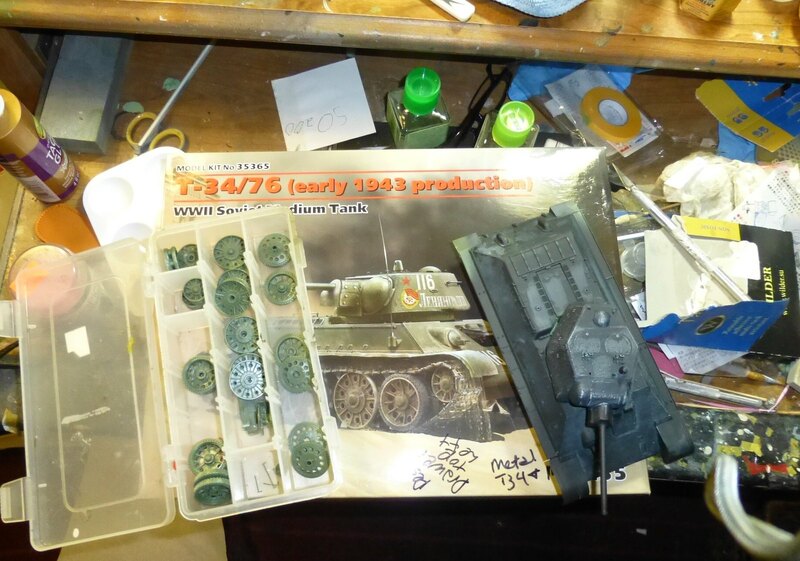 I've promised a T-34/76 ready for Kursk. 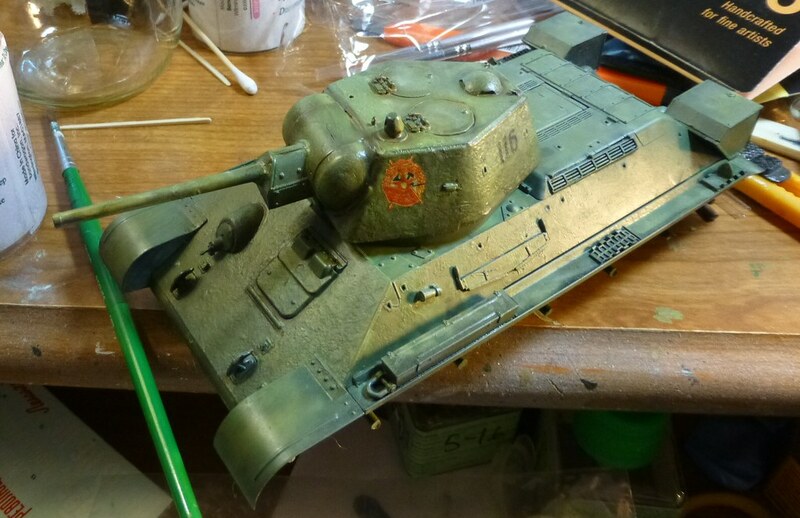 I got the ICM T-34/76 - I had a DML version that I found out was actually later. 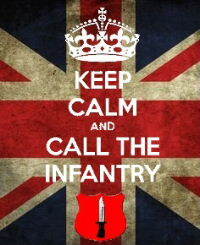 And the ICM kit had a lower part count. 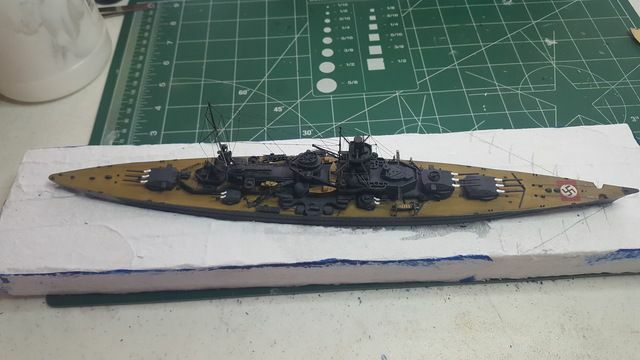 My first 1/350 ship was an ICM Konig done several years back and I swore that I'd never buy another ICM kit. This kit is not bad (get the Revell version rebox both tool 2015 and save $5) but I've been thinking about my old promise. Never do three Tamiya kits in a row and then switch to a Euro blend (in my case Italieri and ICM) - it simply reminds you how much time is wasted. But, it will get done. I've got some plans for a vingette that will include some static grass which isn't stuff I've worked with before. I've got an electronic gizmo and everything. I've been busy and didn't really think anyone wanted to see progress on roadwheels. Below is a pic that shows I'm working on what I said I would. 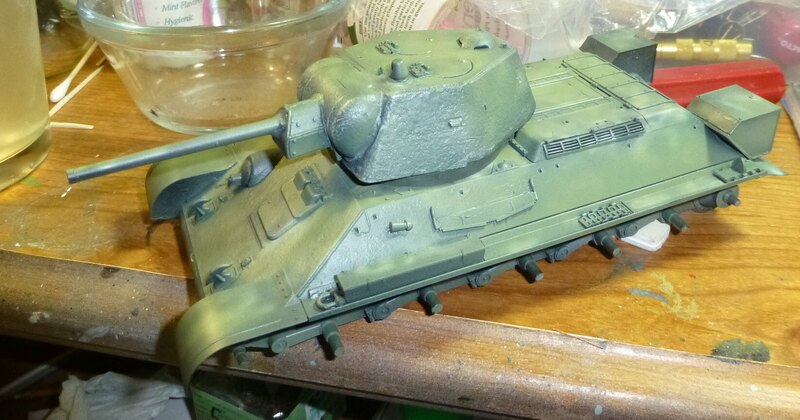 You might note that the tank body is primed black - the wheels etc will be to maybe. Might try the "black/white" techniqe: also might "black base" the kit. Regardless the weatering will take some brains because the tanks shown would have been less than six months old in July 44 - but also dirty/dusty beyond normal comprension. Be back soon: Will try to add my views on other's builds. Thanks for the update, Eric. Looking forward to seeing your build. Why did you earlier swear off ICM kits? I haven't built any, so I don't have any familiarity with them. And: why never do three Tamiya kits in a row? 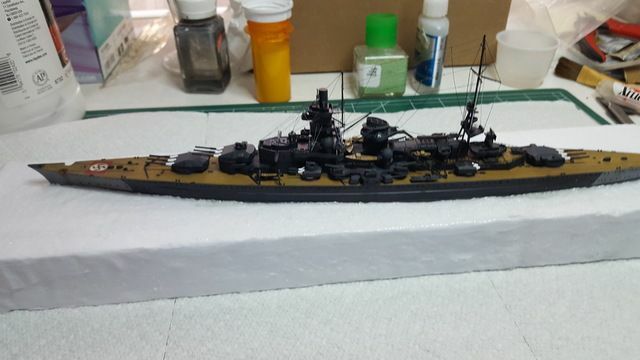 Let's see: I swore off ICM kits because their 1/350 Konig was a bad kit and it was the first 1/350 ship kit I built. 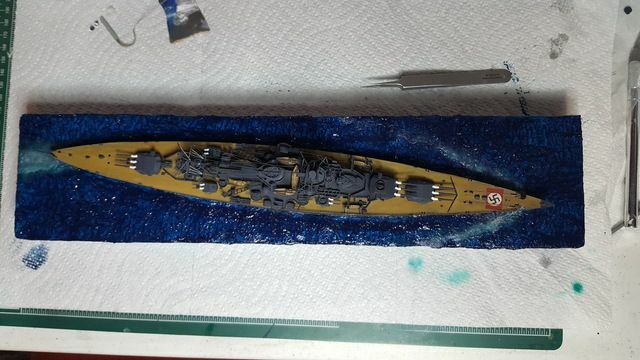 Oddly enough it prepared me for an ancient 1/225 scale USS Oregon which was so utterly screwed up I had to rebuild it. And then put it into gray Spanish=American War colors - one of the best kits I've made. 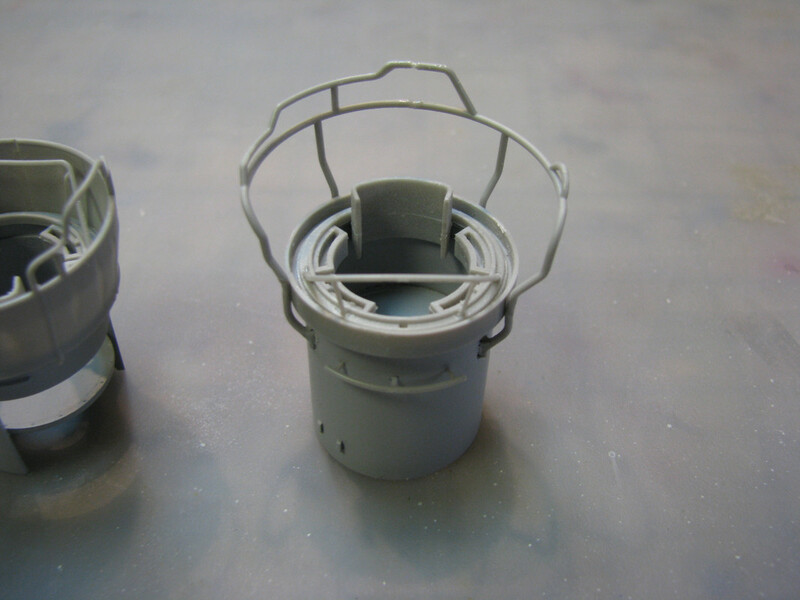 Below is the kit when the base coat is applied very lightly and very slowly. The idea is to have a surface that is not regular. Should note that the paint used is my "go to" Golden High Flow, the planet's best water based acrylic. 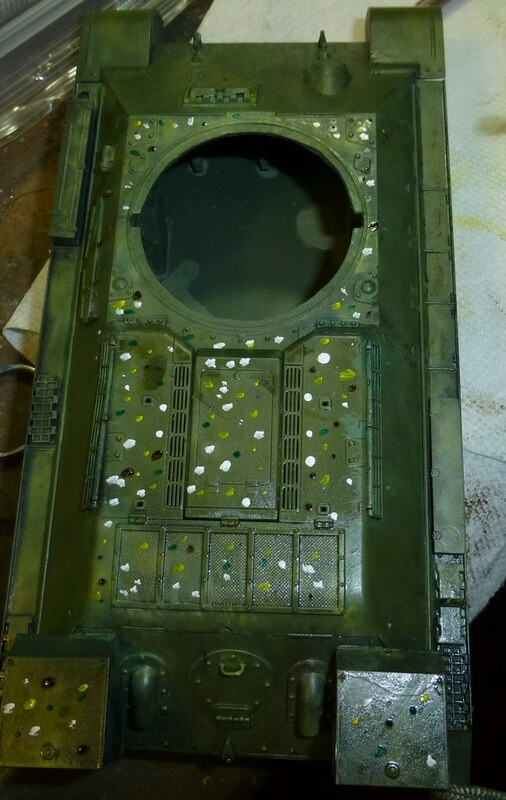 It's true that you have to mix paint to get military colors, but I think that's fun. 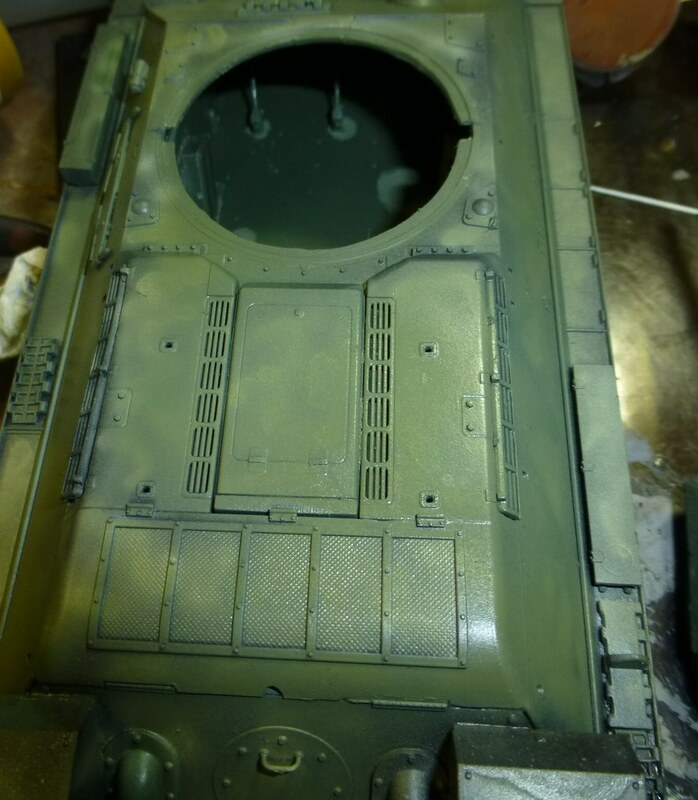 Anyway, the base coat, no matter how deployed, just leaves you ready for weathering. That looks really good, Eric. Quite effective. Thanks for your insights on those ICM kits. Got this out of the stash today, ready for the off I think at the start of next month. This kit has been sitting around in my stash for a few years, and I cant believe I havent done it earlier, as it is one of my all time favourite aircraft. 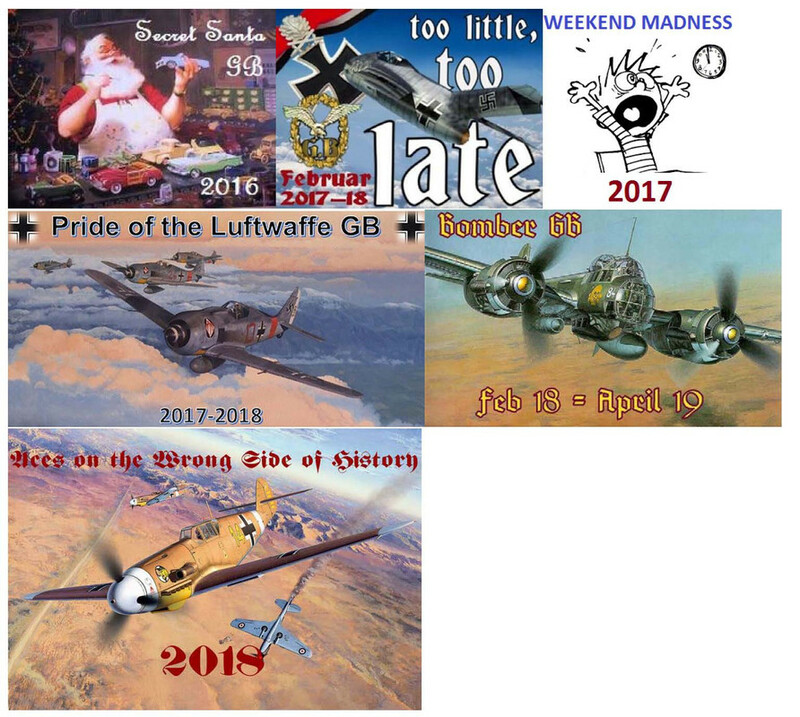 I will be doing in the scheme of "White 576" flown by 1Lt Ed Olander of VMF 214 at Torokina Bouganville in 1943. Will post again when I get started. Looking forward to seeing that one Mark. Need to get one of those myself. Great looking plane, the Corsair. Very sleek. Looking forward to it, Mark. 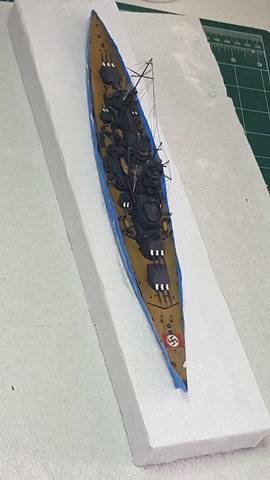 I need to get back to the Scharnhorst if I'm going to have any hope in getting her done for a contest in 2 weeks. I finally received the flags and pennants from Spain, but they can be the last thing I install so they weren't holding me back. 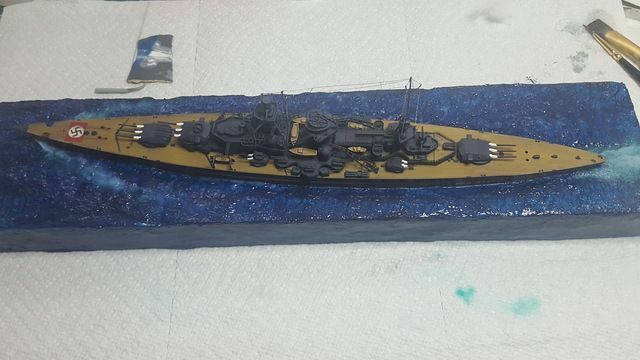 So, I painted the base, added a small bow wave and some foam off the bow and stern. She is turning to starboard so the stern wake is off to the starboard as well. The acrylic varnish is still drying so it's still a little milky. Once dry, I will add more probably 2 more coats of varnish. 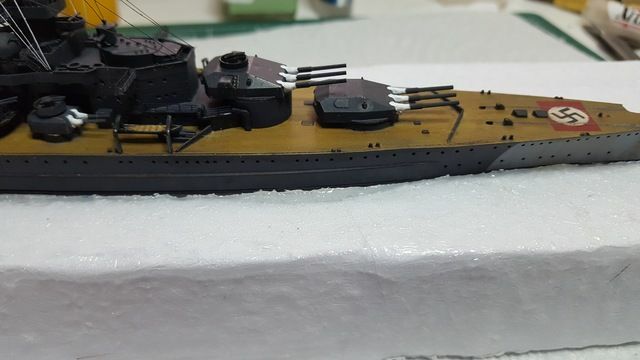 I still need to add some fidily parts, hull railings and flag. If you can pull off the "calm, in-motion" wake well, it will be the frist I've seen. 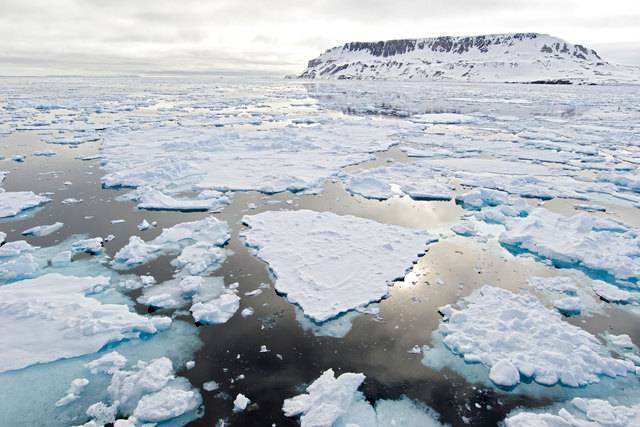 Dead calm - yes (as your Prinz Eugen shows); heavy water, definitely. (Your Hornet is a good example there - you do a good job with cotton: I think Floodberg is right that Rayon works better, and thanks to e-cigarettes is widely available cheap on eBay.) 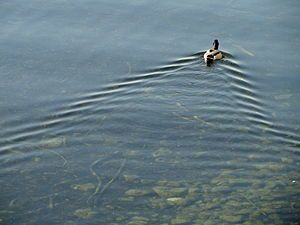 But that dead calm wake is something I can't fathom. Best of luck. 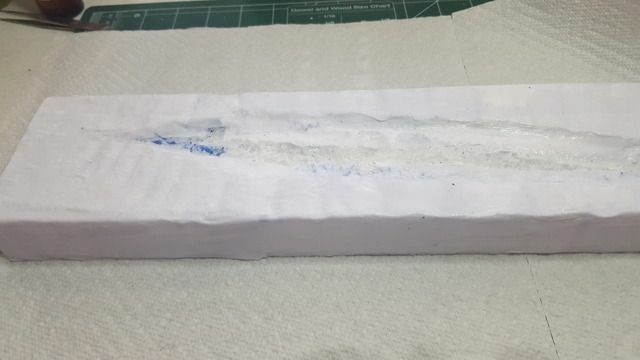 Anyone interested in water bases made by a master can check the four YouTube videos of "Chris Floodberg Model Water." Chris also did a detailed water base for an issue last year in Finescale. Floodberg's techniques have changed greatly. 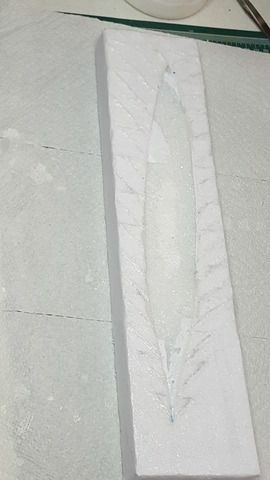 In the base made for Finescale he used "extruded styrene" (usually used for insulation - often pink) which is denser than normal styrene and carved it with a dremel. Personally I like his normal styrene technique mostly molded using heat from a disosable cigarette lighter. 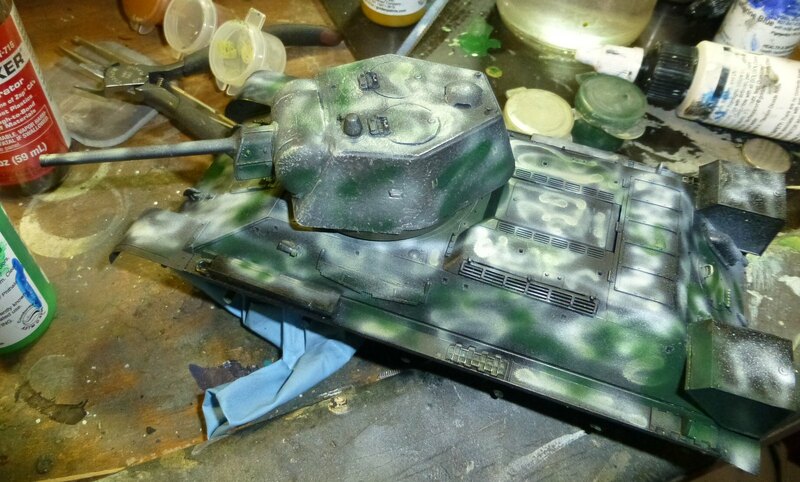 Started weathering. 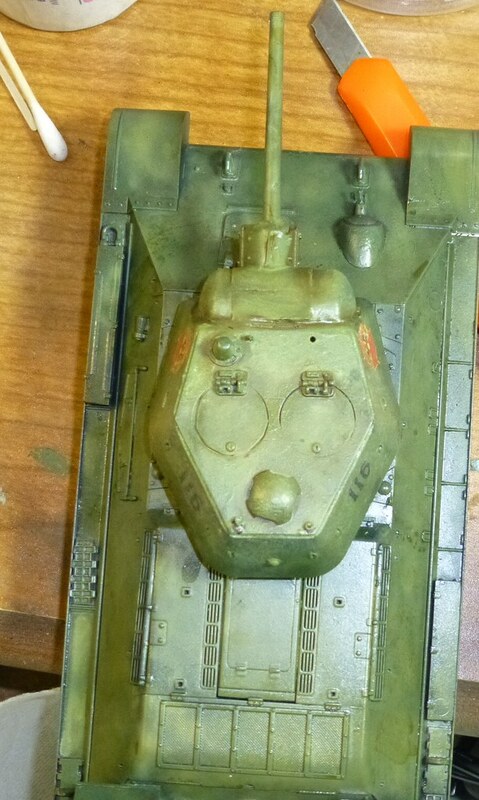 I'm following a long series of YTube videos done by guru Adam Wilder on a KV-1. The series is simply terrific - look at episode 3&4 to see how to do well what I tried. There are a lot of splendid professional armor modelers who have started companies - I find Wilder to be much the best at instructing and illustrating what to do. He uses enamel products and I don't: that's my choice, not the best way to make a model. I bought some Mig "Oilbrusher" oils. Oils in a plastic tube with thin brush inserted. Very thin. OK paints and cheap, but I'd much prefer Wilder's own oils or Gamblin "Fast Matte" oils. Although very different in consistency, both dry fast and matte. The Oilbrusher brings only a convenient tube. The brush in the tube is only good for applying dots (a good 2 or 3 brush is better for that task) and all blending has to be done with a brush anyway. 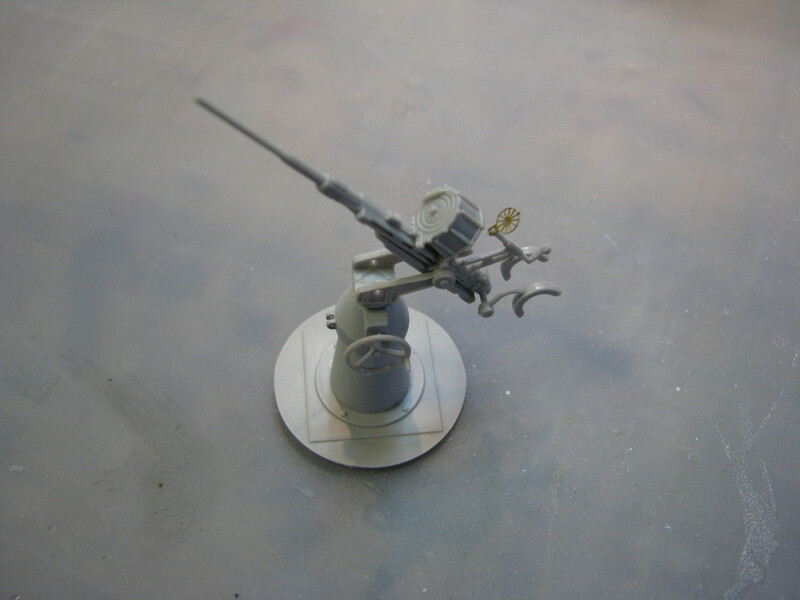 So, consider the Oilbrusher a failed experiment - but the paints are fine and I'll use them. BTW: I needed a dark umber for dot fading and larger scale shading. I only had little tubes of Reeves oils - about $10 for a box of 12 - and mixed black and burnt umber. It worked perfectly well. I don't doubt for modeling use Reeves would do the job fine. I've got Wilder, Gamblin and Windsor Newton and won't throw them away. But Reeves has a very low oil content which means they dry pretty quick - which isn't bad. You need solvent of course. Wilder uses enamel thinner which I hate. (Wilder's products are excellent, and his latest line is water/acrylic based - I'm not the only modeler who doesn't like solvents. 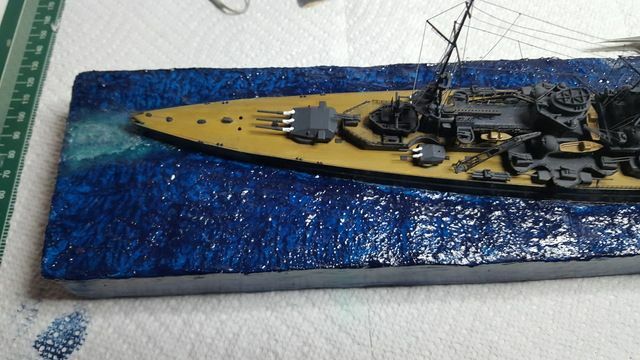 Vallejo's recent line of acrylic weathering stuff is very good.) Anyway, for oils I use a an oil paint solvent called Gamsol - made by Gamblin. Gamblin is one of the best US based oil paint companies and their stuff is top drawer. (Art house pigments are better than anything you'll find in any model line and about a quarter the price. Check Gamblin pigments - I also use upscale Sennelier.) Gamsol is especially made to be odor free and as mild as a oil paint solvent can be and still work to the exacting standards of oil painters. It's simply great unless you really find "oderless" mineral spirits "oderless" which I don't. And it's cheaper. 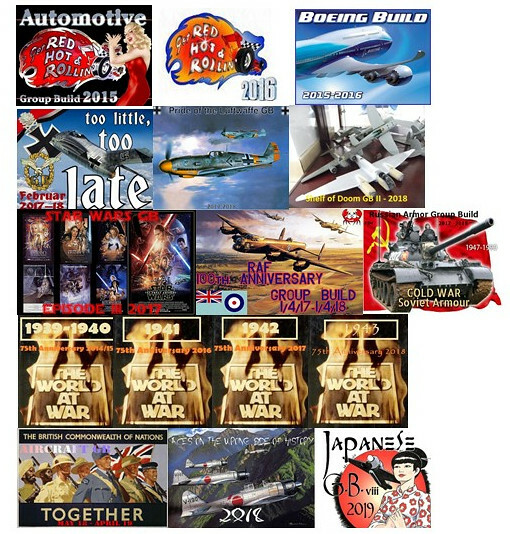 Modelers pay a lot of money for modeling products. 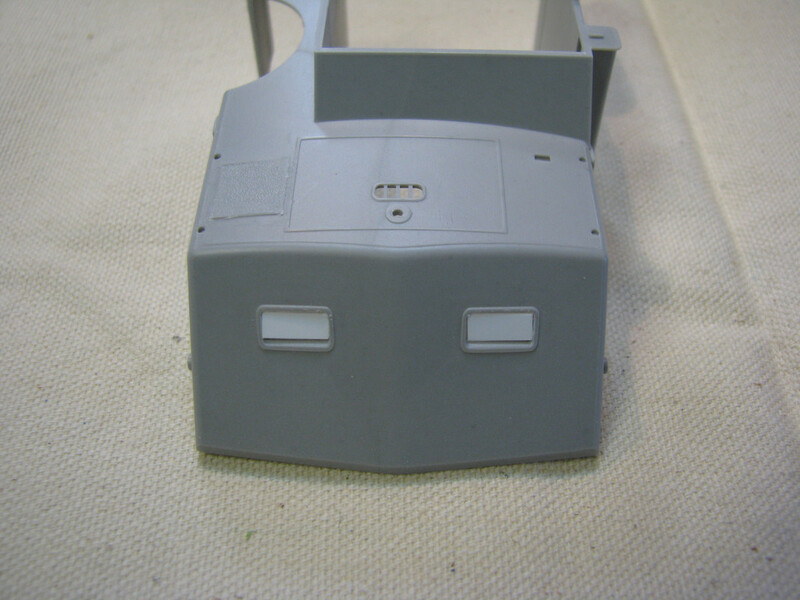 This shows the turret after fading - It's pretty easy to see that the top is lighter than the unfaded body. This is the tank after the oils. The irregular coloring is intact - which I want - and the color much more interesting. 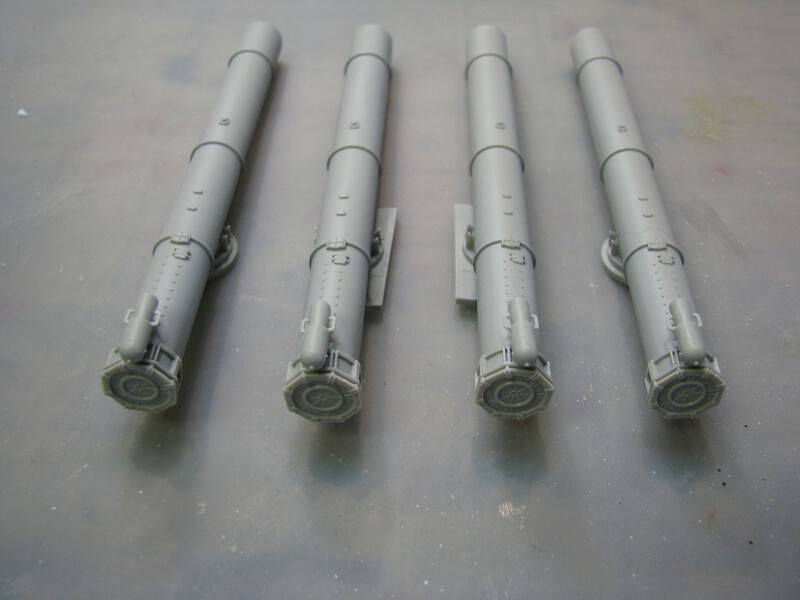 Lots more weathering to come though. Here's my entry. I had been working on it but it was shelved for awhile. If I need to enter something else, please let me know. This gives me a chance to finish up some of shelved models. 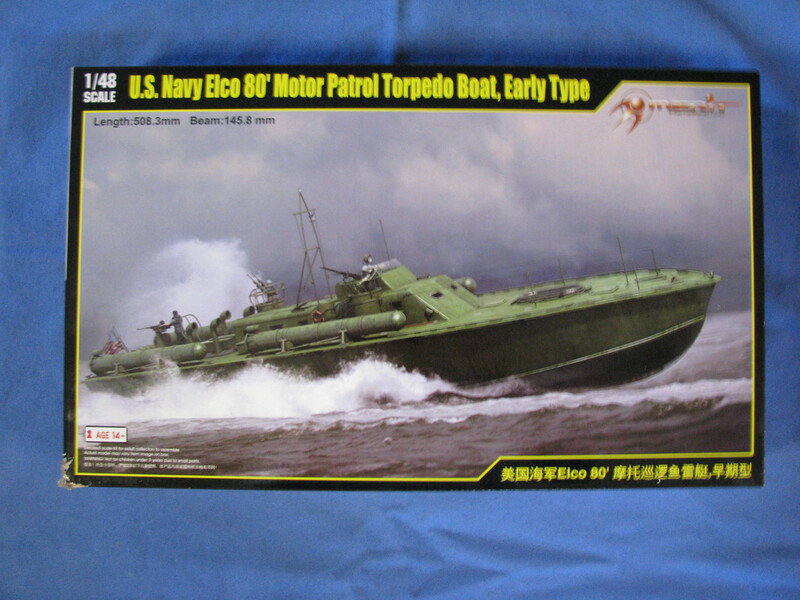 This is Merit's 1/48 scale early Elco 80’ PT Boat. 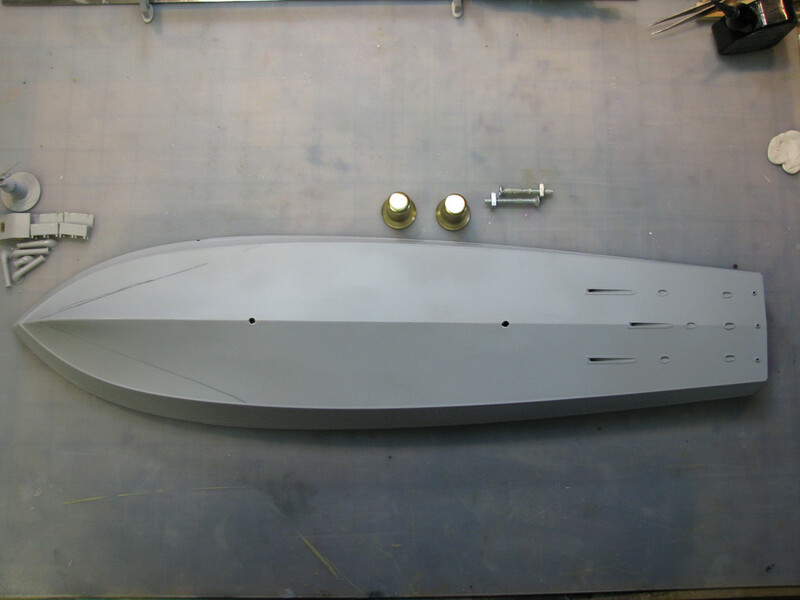 I'm going to model her as the lead boat of that variation, the 103 boat. Thanks Eric, I like the hard Styrofoam for several reasons and I prefer medical cotton over Rayon. Rayon is just too stingy for me to work with. I did an LA class sub using it and just had a heck of a time. I cover my bases with paper as well, it uses less gel that way. I use Golden because it's what I get from HL. I used Liquitex on a couple early water bases and didn't really have an opinion at the time. Here is the base now that it has dried. 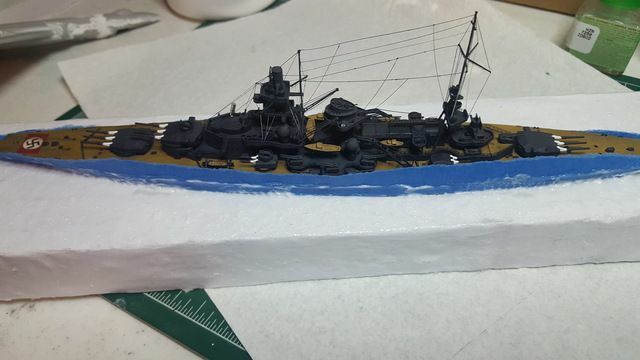 I'm adding the hull railings now. I'm not as good as Chris by any stretch but I'll get there someday. BTW I finished a water video for YouTube, although not professional or polished by any means but I hope somebody will get some use out of it. As soon as I get it up and working I'll post a link.